This is my collection of VIS-G Patches I created for the modding guide "Crossing the great wastes" by Ape75. You can do what you want with my patches. They are just patches. Nothing more. Gambit77 - Creator of VIS-G and very helpful, when I had questions. takatoriyama - Took his files as an inspiration. Wenderer - Created an awesome Fomod Creation tool. All authors and their mods listed in description. 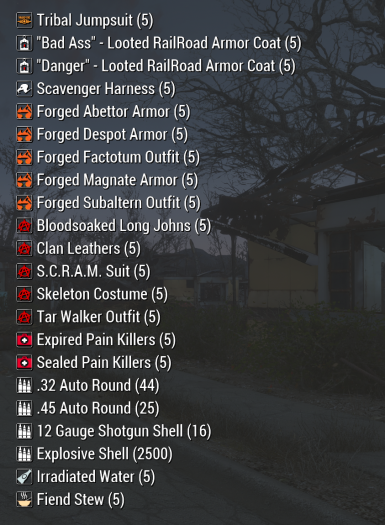 Updated Raider Overhaul - Added tagging to some clothing that I overlooked. Added Armorsmith Workbench support to many clothes. Accidentally spelled "Grease" instead of "Greaves"
I've flagged all my patches as ESP/ESL, which has nothing but benefits, especially for patches. They no longer count towards the 255 plugin limit. You can still sort them like normal .esp's. Tested with Mod Organizer 2. Should work with Vortex. 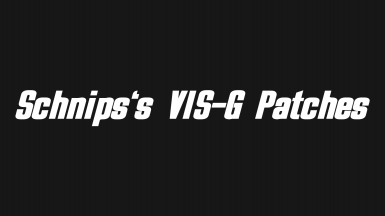 Install VIS-G Item Sorting﻿ (Main file) and its requirements. Additionally you need Armorsmith Extended﻿ for some of my patches. Make sure that nothing overwrites Instance Naming Rules (check with FO4Edit) ﻿and ...\interface\ folder of VIS-G. I recommend MO2 for adjusting your load order. -We Are The Minutemen in combination with Far West Minutemen﻿. IMPORTANT: My patch is made for We Are The Far West Minutemen﻿, which requires My_Minutemen.esp as a master. IMPORTANT: Install "Raider Overhaul WIP 12.4 Main File". Install "Raider Overhaul-AE Patch-Restored Content I Full File". Remove ESP only "Raider Overhaul - AE Patch- Restored Content.esp" (disable it, MO2 users can move it to optional). Install my patch. Please report bugs like missing/wrong icons, weird naming, etc.